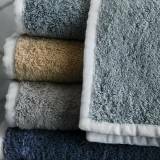 At once relaxed and refined, Enzo towels are made from our lush Cairo long-staple cotton terry and embellished with 1/2 inch linen piping with smartly mitered corners. Traditionally available as a white towel with a colored linen border, Enzo is now available with a colored Cairo base with 100% linen piping for a high contrast look that is the epitome of casual couture. Made in the Philippines of 100% Cotton fabric from Portugal, shower curtains are made on 100% White Linen. Care Instructions: Machine wash warm, gentle cycle. Do not use bleach or fabric softener. Tumble dry low heat. Iron as needed. Iron shower curtains while still damp. 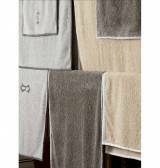 Matouk Enzo Bath Towel With 5.5 Inch . . .